This Swingline Stack-and-Shred 600X Auto Feed Cross-Cut Shredder with SmarTech revolutionizes office shredding. This auto feed shredder sends real-time status updates straight to your phone or tablet, freeing you up to do other tasks while the 600X does the work. With the easy-to-use SmarTech Shredder app, you’ll be able to keep track of shredding with notifications if the shredding job is interrupted for any reason, and when shredding is completed. The Stack-and-Shred 300X shreds up to 600 sheets with automatic shredding and up to 10 sheets at a time during manual feed shredding. It auto shreds documents, paper clips and staples and manually shreds credit cards, DVDs and CDs. It features a large, 21-gallon pull-out waste bin with bin full indicator and attached wheels for easy mobility. Some other user-friendly and intelligent features include Auto+ Jam Clearance, Self-Cleaning Cutters and Power Save for virtually effortless shredding. The Swingline Stack-and-Shred 600X is backed by a 2-year warranty on machine and 15-year warranty on cutters. 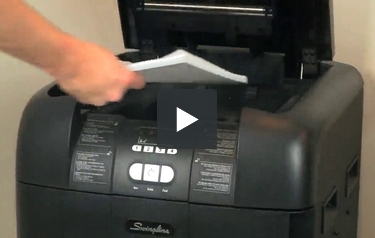 Spend less time shredding versus a traditional shredder - just stack, shut and you're done. Super cross-cut shred style meets everyday security with added security for documents containing sensitive or personal information (Level P-4). Shred up to 600 sheets with automatic shredding and up to 10 sheets at a time during manual feed shredding. 21-gallon pull-out waste bin with bin full indicator. Ultra quiet (=60dB) to ensure minimal disruption in the office environment. Lockable paper chamber with 4-digit programmable PIN protects sensitive information during shredding. Intelligent SelfOil™ feature extends cutter life. Intelligent Auto+® Jam Clearance reverses and re-feeds stuck papers. 2 year warranty on machine with onsite service, 20 years on cutters. 21"L x 20"W x 32"H.
Tears up paper like a champ, bout LOUD! My son and my daughter loves this so much! And everybody of my family like this....Excellent quality !! Positive: Love the fact that this item is hands free as it gives you the ability to do other tasks while shredder is working. Negatives: Do not like the fact that you have to open and close the unit to shred each CD/DVD. Would have preferred a top CD shred dispenser. Also wish the unit was taller allowing for a larger bin to get more use out of each bag. The wire bin container is also a let down as its construction is poor and often grabs the bag causing the bags to tear. Introducing the new Stack-and-Shred 500X Hands-Free Shredder. It's a better way to shred. The 500X is ideal for larger offices or shared spaces, shredding up to 500 sheets of paper, including legal-sized sheets, automatically. The patent-pending hands-free auto-plus technology means that shredding tasks are now as easy as stack, shut, done. Standing in front of the shredder is a thing of the past. The Stack-and-Shred 500X features cross-cut shredding and can even shred CDs and credit cards. A four-digit programmable PIN lock offers extra security for confidential documents so you can attend to other business. Just enter any four numbers and the shredder will not open again until the job is completed. The PIN number resets every time so you can be sure your information is being securely shredded. Automatic jam clearance, self-cleaning and self-oiling cutting blades are just some of the features designed to make the operation and maintenance of the Stack-and-Shred 500X a breeze. Don't waste your time standing in front of a shredder when you can be doing something else. 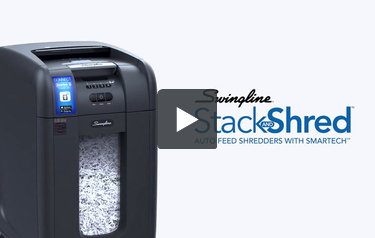 It's time to delegate the shredding to your shredder with the new Stack-and-Shred 500X from Swingline. This machine can shred CD's, credit cards, and documents that still have staples and paper clips attached to them. You will need to use the feed opening when shredding these devices. They cannot be placed in the main shredding area. If you need a lot of security, this is a great shredder to use. It's a cross-cut machine that will produce shreds that measure 3/16" x 1-1/2". Put another way, it can turn a piece of letter-sized paper into 377 bits. You can also use a PIN with this machine to lock the shredder as it works. The Stack-and-Shred 500X has a continuous-duty motor so you will be able to shred your documents throughout the day. The machine has jam-free technology and the ability to clear paper jams automatically, so you will be able to get rid of your documents without any trouble. This machine is perfect for shared use by several people. The waste bin can hold up to 21 gallons of material so it won't need to be emptied very often. When it's time to get rid of the shreds, just open up the cabinet, and pull the bin out. Make sure to get rid of any plastic shreds which are stored in an adjacent plastic bin. This shredder works quietly so you can get rid of your documents and such without making a racket. Also, maintenance is a snap with this machine since it has an automatic oiling system. Finally, the Stack-and-Shred 500X comes with a 2-year warranty. On-site service is included for your convenience. This shredder is fairly large so you probably won't be able to store it under a desk. The best place for it is in a copy or printer room so everyone can access to it. The Stack-and-Shred 500X can't shred floppy disks or DAT tape. You will need an additional machine to destroy those kinds of items. As you can see, the Swingline Stack-and-Shred 500X has many more strengths than weaknesses. This state-of-the-art shredder is ideal for busy offices and it has one of the highest shredding capacities you will ever come across. This machine can not only shred up to 500 sheets at once, it can also take care of CD's and credit cards. Also, this shredder can be used continuously which is helpful when you need to get rid of a lot of documents in a short period of time. While this machine can't shred floppy disks or DAT tape, it nonetheless is a high-quality shredder. Check out the Stack-and-Shred 500X today. In which country is this shredder made? Thank you for your question. We contacted Swingline and they confirmed that the Stack-and-Shred 500X Hands Free Shredder is manufactured in China. I have emptied out the bin cleaned the area of loose paper. but for some reason it will not shred anymore. the 2nd icon is lit red and will turn off after a minute. What is wrong with my shredder? PLEASE HELP??? The Bin Full icon also doubles as the door open icon. The autofeed chamber or the bin door may be open. Try closing this and see if it goes off.